I welcome you brothers, sisters and friends to share information about this blessed Hospital that was founded on profound love for humanity. May the Peace of our Lord Jesus Christ, the Love of God the Father and the Fellowship of the Holy Spirit, be with you as you read this information about St. Joseph’s Hospital Kitgum. St. Joseph’s Hospital Kitgum was started as a health post by the Comboni Missionaries (sisters) in 1949 and became a full hospital in 1960. This is one of the three biggest hospitals in Gulu Catholic Archdiocese that were founded by the missionaries; others include Lacor and Kalongo Hospitals in Gulu and Pader district respectively. 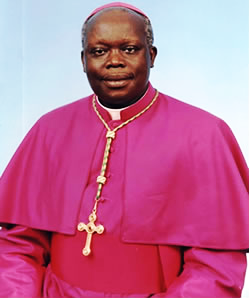 The Catholic Church in Gulu Archdiocese founded St. Joseph’s Hospital Kitgum following the mission of the universal church which is based on the imitation of Christ and his deeds. The mission of the hospital is to promote life to the full and to heal. The Catholic Church was mandated to sow the seed of the gospel to the hearts of every person. The biggest component of the gospel of Christ is Love; and the fruits of love as demonstrated by the Comboni Missionaries were education, health and other social services. This was a clear manifestation that the gospel of Christ addresses the whole person; the Soul, the Body and the Mind. The Intellectual component of the gospel of Christ is through education and when you educate a person you actually open the door for him / her to reach the whole world. In respect with the Body,the Church in Gulu Catholic Archdiocese established hospitals especially St. Joseph’s Hospital Kitgum among others and for effective functioning,health centers at the peripheral levels were created like St. Peter and Paul Padibe Health center III, and Puranga Health center III. We rejoice and praise God for these achievements during our time. On the 27th of November 2010 the hospital marked 50th years of its dedicated services to the vulnerable community of Northern Uganda and beyond, and it was a moment of reflection over what the hospital has achieved and what it intends to achieve in the future. I would like to thank in a special way the founders of this hospital, the Comboni missionary, the Priests, the Brothers and about all the Comboni Sisters. The Sisters who played very important roles in starting this hospital wereSr. Amalia Lonardi, Sr. Secondina Chito, Sr. Liduina Vavassori, and Maria Rosa Magri. I thank God for these Sisters and others who contributed to the development of this hospital. I would like to thank all the staff some of whom have died like Dr. Rev. Fr. Manuel Albert Grau and many other Doctors, Nurses, Sisters and other lay workers in this hospital and also currently those who are managing it Dr. Lawrence Ojom, Mr. Robert Ochola, and Rev. Sr. Liberata Amito,and other staff who are there. I would also like to thank those who made the land available for this hospital and for Kitgum mission parish in general so that services are offered to the people. This is an achievement for us who have benefited in one way or the other from this hospital, and we should thank God for this and we have to rededicate ourselves together now to own this hospital and support it in all possible ways through our prayer, materially, and through user fee among others so that the hospital continue to provide services. I thank all the benefactors and donors who have been supporting this hospital especially during the most difficult time of insurgency. I am indebted to thank AVSI, Manuel Grau Foundation in Spain, Catholic Relief Services, UNICEF, UCMB, and World Food Programme among others. I still appeal to the people of good will and hearts of generosity to support this hospital so that the vulnerable community in Northern Uganda and Southern Sudan are served better. May the good Lord reward you abundantly.